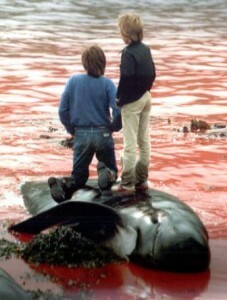 Sea Shepherd has led campaigns to oppose the grind in the Faroe Islands since 1985. During the 2011Operation Ferocious Isles campaign, not a single whale was killed while Sea Shepherd was on patrol during the July-August high season. So far this is the only way that the lives of these magnificent animals have been saved. This work was chronicled in a five-episode series on Animal Planet called “Whale Wars: Viking Shores” (2012). 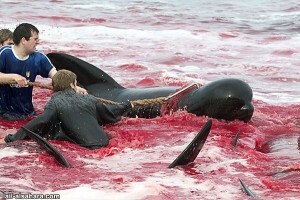 The Faroes Islands: cruel whale and dolphin slaughter! 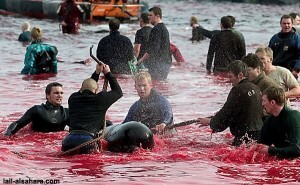 An average of 700 pilot whales and dolphins or more are brutally slaughtered in the Faroe Islands every year. 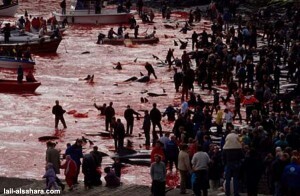 Entire family groups of whales, known as pods, are driven ashore and killed with knives. The whale hunt, or grind as it is known, has been conducted for centuries. It once provided important food for the Faroese population, but today it is little more than a cruel tradition that produces meat and blubber that Faroese health leaders have warned is no longer safe to eat because of the toxic pollutants that concentrate in the whales. In 2012, over 700 terrified pilot whales were driven ashore, gaffed with steel hooks and dragged into the shallows, their necks cut with knives so they bled to death. Entire pods of whales were killed: pregnant whales, mothers and their calves, none were spared a terrifying and agonising death. The Faroes have said they want to kill whales commercially and it is no coincidence that Denmark, which also defends the ‘subsistence hunting of endangered whales in its other dependency of Greenland, is backing the resumption of commercial whaling at the International Whaling Commission (IWC). Denmark’s position is held in open defiance of the rest of the European Union which is opposed to the commercial hunting of whales. The Faroes Food and Veterinary Agency has recently recommended that consumption of whale meat be limited to no more than once a month, with women advised to avoid it altogether if they plan to have children or are pregnant or breast-feeding. These toxins are also known to harm the nervous and imune system development of children. 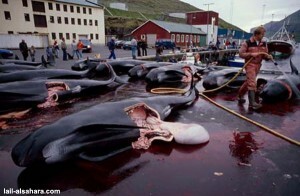 This is because of the toxic contaminants that accumulate in the whales bodies through the food chain. These contaminants include mercury in the flesh, liver and kidneys and polychlorinated-biphenyls (PCB’s) in the blubber. PCB’s are highly toxic industrial compounds linked to damage to the immune system and reproductive failure. Although subject to a voluntary manufacturing ban since 1977, some countries still produce them (see our environmental briefing section for further in information). Campaign Whale has visited the Faroe Islands on four occasions over the last year, meeting with government officials, public health leaders, local people and the whalers themselves. We were also able to attend the annual meeting of the International Whaling Commission (IWC) in Panama City in June 2012 where we helped pass a resolution called on member governments to responsibly inform the public about the health risks from eating contaminated whale meat and blubber. Slaughter. That’s a strong word… but not strong enough. How else could one describe these images? Thousands of people have signed petitions. 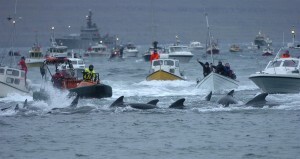 The government of Denmark / Faroe Islands ignores them; petitions go unheeded. 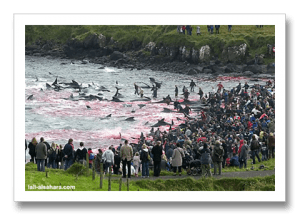 It is time that we, citizens of this planet, called upon our own governments to tell Denmark / Faroe Islands that the whales and dolphins they slaughter are not theirs to kill. It is time that we fought back for the sake of those who cannot speak at our courts. We must demand that our government put Denmark and the Faroe Islands on notice: We will NOT passively permit you to continue this vulgar practice! We will place sanctions against you until it stops. We will not buy or sell with you. You are shunned, unwelcome, until you stop slaughtering these fellow residents of the earth. This is our planet, the earth is our mother, and all of the creatures who share it with us are our fellows, brother and sister inhabitants. It is not ours to do with as we please. We’re only here borrowing it for a while. 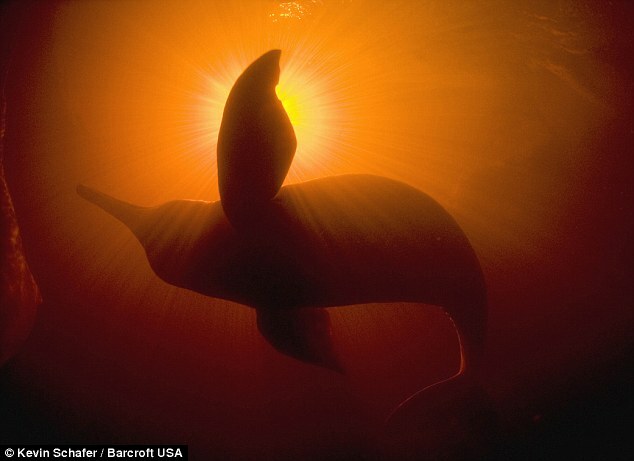 The Calderon dolphins may very well be led to extinction by this killing, and extinct is forever. 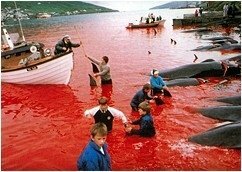 They are just one of the species of cetaceans killed by these people. NO intelligent creature should be treated this way. 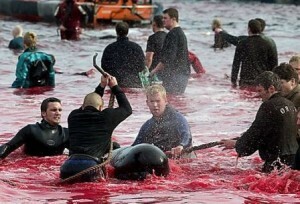 Despite claims to the contrary, the Faroese do NOT need to do this to survive. Please, do all you can to make it stop. P.S. Apologies to any Danes who feel they are being unjustly singled out, but the fact remains that the Faroe Islands are a territory of Denmark. If Denmark wants to sever all ties to that territory, we will be glad to change the title of the article. Until then, the title remains accurate. PPS: It has been nearly 2 years since this article was written. We have invited the Faroese into a discussion, and they participated. When it got circular and there was nothing more to be gained, I ended the discussion. There have been many comments submitted EVERY DAY about these ongoing horrors. Many of them are emotional, reactionary, and have at least some of the facts wrong. But the facts that they’re mistaken about are not foundational; their position isn’t any less right, for example, that they thought Pilot “whales” are endangered, or if they’re called Calderon or something else. For the past year or so, I’ve censored out many posts that called for violence to the Faroese. I have just release them all, editing out only the most offensive of them, allowing people’s own words to “speak” for them, for better or worse. Thanks to all of you for your passion and involvement. Though the Faroese have turned down offers to supplement their income in lieu of continuing the Grind, it remains our most fervent hope that they will do so of their own will. 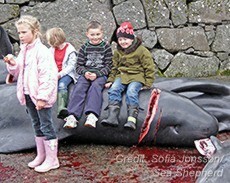 Children of the Faroe Islands, showing no respect for the slaughtered pilot whales. ~ by FSVSF Admin on 28 August, 2013.